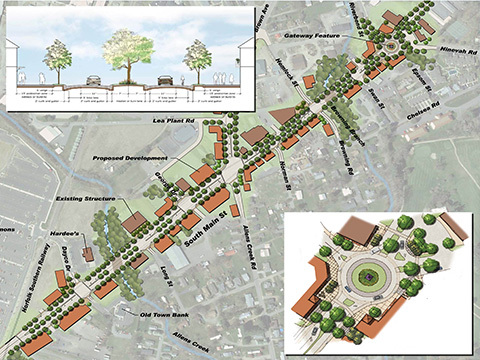 Springs-Apartment-Civil-EngineersIn association with the Landscape Architecture Firm LaQuatra Bonci Associates, and the Traffic Engineering Firm JM Teague Engineering, Brooks Engineering Associates provided a Master Development for South Main Street in the Town of Waynesville. The existing road section was a harsh environment with no landscaping, no sidewalks, and poor infrastructure. As part of the plan, the team planned for a boulevard road section with landscaping, sidewalks, bike lanes, and improved intersections and driveway access. The team worked with the Town, the Public, and the NCDOT and led several public meetings to create a plan that will encourage growth and renovation along the corridor.